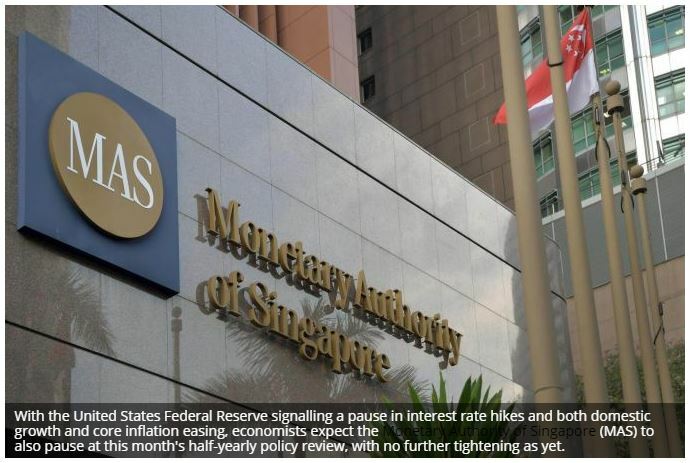 WITH the United States Federal Reserve signalling a pause in interest rate hikes and both domestic growth and core inflation easing, economists expect the� Monetary Authority of Singapore� (MAS) to also pause at this month’s half-yearly policy review, with no further tightening as yet. February’s core inflation reading was 1.5 per cent year on year, down from January’s 1.7 per cent. The lower-than-expected figure “cements the case for a pause at the upcoming MAS April review”, said ANZ head of Asia research Khoon Goh, adding that there is “no pressing need for the MAS to further tighten policy at this stage”. Last April, the MAS tightened monetary policy for the first time in six years, ending two years of neutral policy by moving to “a modest and gradual appreciation path” that lets the Singapore dollar rise against the currencies of major trading partners, within an undisclosed band. In October, the MAS tightened a second time. But given both external headwinds and domestic conditions, economists do not see a third tightening coming. “Clearly, neither growth, nor inflation recommend further tightening this cycle,” said Deutsche Bank economist Vaninder Singh and strategist Mallika Sachdeva, citing slowing global growth and domestic consumer sentiments having been hurt by tighter property measures, faltering financial markets late last year and declining wage growth. They see the likely lack of further tightening in April to not just be a pause, but the start of a shift away from hawkishness. Further out, they expect the October statement “to have a dovish bias”, and for the MAS to ease policy in April next year. Citi economists Kit Wei Zheng and Ang Kai Wei also expect the MAS to stay put this April, but consider it a close call. The risk of a final steepening “probably remains higher than often assumed”, they said, pointing to persistent underlying cost pressures. Excluding telecomms and electricity, core inflation remains about 1.7 per cent. And though the job market eased in the fourth quarter, it remains tight, they added, noting that unit labour cost continues to accelerate. Even as economists agree that an MAS hold is likely in April, their inflation forecasts vary. The official forecast is for core inflation of 1.5 to 2.5 per cent in 2019. In the MAS survey of professional forecasters, the median forecast is for core inflation of 1.7 per cent. UOB economist Barnabas Gan sees core inflation coming in at the higher end of the official forecast, expecting it to average 2 per cent in 2019, though crossing the 2 per cent handle only in the second half. Most other economists have more muted expectations. OCBC Bank head of treasury research and strategy Selena Ling’s forecast is 1.7 per cent. The Citi economists see core inflation hovering around 1.6 per cent for March till June, then averaging 1.4 per cent in the second half of the year. Maybank economists Chua Hak Bin and Lee Ju Ye see risks to core inflation staying on the downside, as the open electricity market broadens to more areas in March and May, further lowering utilities costs. After the February inflation figures, they cut their average core inflation forecast to 1.4 per cent for 2019 – and expect the MAS, too, to lower its forecast. In the coming months, they see the MAS as likely to forecast core inflation as being 1-2 per cent instead, “given subdued inflation pressures and the larger than expected impact from the open electricity market”. The Deutsche Bank analysts also expect the MAS to reduce its core inflation forecast to that range, “even as the statement’s forward guidance on growth is likely to remain largely unchanged”. They see GDP growth staying on course to come in near the middle of the official forecast range of 1.5 to 3.5 per cent, “albeit at a below-potential level of 2.4 per cent”. On other indicators, OCBC’s Ms Ling observed that while the domestic 2- to 10-year Singapore Government Securities (SGS) bond yield curve has not yet inverted – which would predict a recession – the three-month Treasury bill to 10-year SGS bond yield has flatlined. Apart from a blip in December 2018, the last time the latter “was sustained in inversion territory” was in late 2006 to early 2007, before the global financial crisis. This “should give policymakers some food for thought”, said Ms Ling. Last week’s bank loan figures for February also showed consumer loan growth decelerating to 0.5 per cent year on year, the slowest pace since at least 2005, she added.